The first ever accurate GPS-based recreational map of the Chilliwack West (Skagit Range) area including access roads and highways, forest service roads, tracks, trails and mountaineering routes (MR). Roads and trails are qualified to enable best route finding. 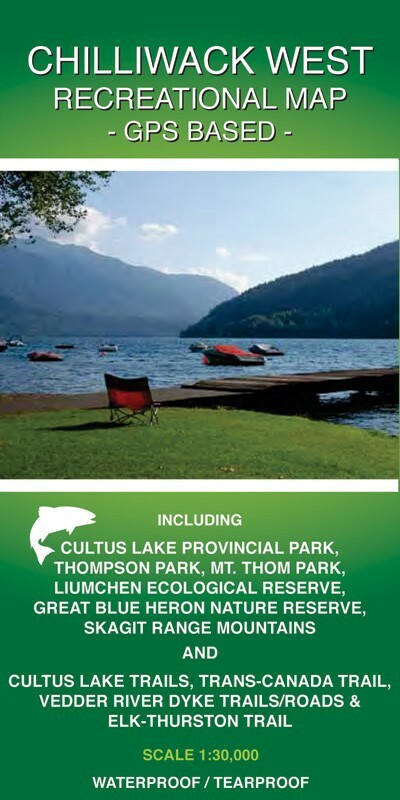 Includes Cultus Lake Provincial Park, Luimchen Ecological Reserve, Great Blue Heron Ecological Reserve, Thompson Park, Mt. Thom Park, and the Vedder Mountain area. For camping, hiking, boating, mountain biking, fishing, whitewater kayaking, rafting, and mountaineering activities. Also for motorized activities including 4-wheeling, quad riding, and dirt biking. The first ever accurate GPS-based recreational map of the Chilliwack East (Skagit Range) area including access roads and highways, forest service roads, tracks, trails and mountaineering routes (MR). Roads and trails are qualified to enable best route finding. Includes Chilliwack Lake Provincial Park, Bridal Veil Falls Provincial Park, Chilliwack River Ecological Reserve, and Cheam Lake Wetlands Regional Park. For camping, hiking, fishing, whitewater kayaking, rafting, paragliding, and mountaineering activities. Also for motorized activities including 4-wheeling, quad riding, and dirt biking. 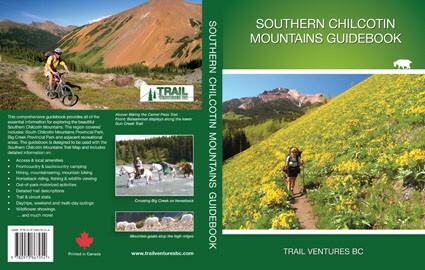 The first-ever guidebook for the Southern Chilcotin Mountains is now available! This guidebook is designed to be used together with our Southern Chilcotin Mountains Trail Map for better navigation through this vast, complex trail system. Covers the South Chilcotin Mountains Prov. Park, Big Ck Prov. Park, Slim/Taylor/Paradise MTAs, adjoining trails outside the park boundaries, and the Mud Lakes area. This guidebook provides ALL of the essential info needed for day hiking, backpacking, mountaineering, mountain biking and horseback riding. Includes info on access & local amenities, frontcountry & backcountry camping, fishing, wildlife viewing and wildflower showings. Detailed trail descriptions are also provided for turn-by-turn instructions. Trail & circuit stats are given for all trails as well as suggested daytrip, weekend and multi-day outings. And much more! Updated third edition of the accurate GPS-based trail map of the Southern Chilcotin Mountains area including access roads, tracks, trails and mountaineering routes. Roads and trails are qualified for best access info and trail finding. Now 2-sided with a 1:30,000 map of the core area added to the backside. Includes the South Chilcotin Mountains Provincial Park, Big Creek Provincial Park and the Mud Lakes Area. For hiking, mountaineering, backcountry skiing, mountain biking and horseback riding activities. Also for motorized activities including 4-wheeling, quad riding, and dirt biking outside of the protected areas. 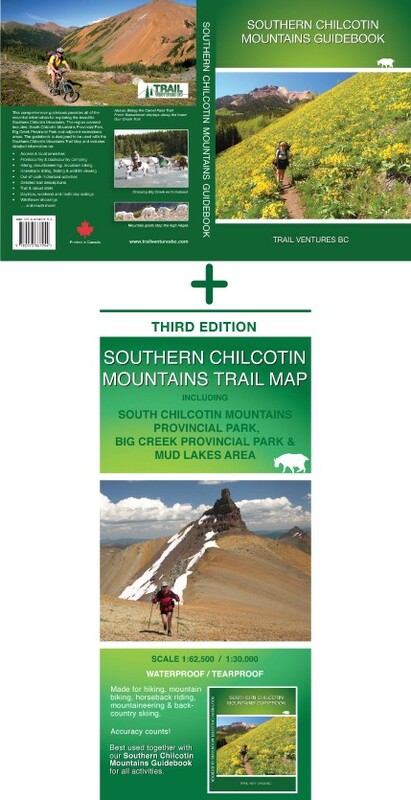 Purchase the first-ever guidebook for the Southern Chilcotin Mountains together with our Southern Chilcotin Mountains Trail Map – 3rd Edition and receive 10% off. The guidebook is designed to be used with the 3rd edition map. NEW! UPDATED 2nd Edition! The first accurate and detailed trail map of the entire North Shore mountains area. This map is made for walking, hiking, mountain biking and mountaineering. All trails between Deep Cove, Horseshoe Bay and Porteau Cove are included. The entire Howe Sound Crest Trail is covered. This edition includes several new trails and parking areas. Includes Cypress Provincial Park, Lynn Headwaters Regional Park, Lynn Canyon Park, Mount Seymour Provincial Park and Lower Seymour Conservation Reserve. The entire Howe Sound Crest Trail, Baden Powell Trail and Trans-Canada Trail (partial) are covered. All mountain bike trails are also shown. The first accurate and detailed trail map for the entire Stein River Valley area and surroundings. This map is made for walking, hiking, mountaineering, camping and backroad driving. The Stein Valley Park, Joffre Lakes Prov. Park, Cerise Creek Conservation area, Lizzie Creek area and Duffey Lake Prov. Park are included. The entire Stein Traverse is covered. Also shown are Van Horlick, Blowdown, Texas, Siwhe & Kwioek Creek areas. NEW! Accurate and detailed trail map for the Port Moody, Coquitlam, Port Coquitlam, Widgeon Ck Valley, Buntzen Lake, and Pitt River/Pitt Lake areas. This map is made for walking, hiking, mountain biking, cycling, mountaineering, camping and paddling. Belcarra Regional Park, ‘Indian Arm Provincial Park’, Pinecone Burke Provincial Park, Minnekhada Regional Park, Widgeon Marsh Regional Park Reserve & Pitt-Addington Marsh WMA. Rocky Point Park, Town Centre Park, Bert Flinn Park, Coquitlam River Park, Ridge Park, Eagle Mtn Park, North Hoy Ck Park, Noons Ck Park & many more!